Old Mutual Zimbabwe Ltd, the country’s biggest insurance and property firm, now plans to install up to 20 megawatts of rooftop solar panels on all its commercial buildings over the next two years to help ease a countrywide power crisis that has begun to drag profits down, company officials said. As state power utility ZESA Holdings struggles to generate enough electricity to meet demand, power outages have hurt businesses in recent years, according to the Confederation of Zimbabwe Industries (CZI). During 2015-2016, as drought hit hydropower production in much of southern Africa, industrial production fell by more than 50%, confederation officials said. Now a growing share of companies are looking to solar power not just as an alternative to the grid but as a way to cut costs and keep businesses going in a country where energy costs can be a substantial drain on businesses. But progress is so far slow, though picking up speed, officials said. “By securing clean reliable power in its (Old Mutual) buildings, this will benefit its commercial tenants who rely on consistent availability of power,” said Simba Mhuriro, chief executive of Oxygen Africa Ltd, an independent energy producer that won the contract to put in place Old Mutual’s $38 million solar project. The company has begun a technical study to establish how power consumption operates at the Old Mutual properties in question, using a $1 million grant from the African Development Bank. Mhuriro said the project will provide power for lighting and heating, and for operating office equipment and small machinery, such as sewing machines, for over 8,000 small businesses renting space from Old Mutual’s $500 million property portfolio, which spans offices, homes and shopping malls. “The systems will be grid-tied systems that integrate both solar and grid power. The solar will primarily displace grid power during the day,” Mhuriro told the Thomson Reuters Foundation by email. Zimbabwe’s government has said it needs $3 billion in aid to meet its goals to expand off-grid solar power laid out in a government plan drawn up as part of the Paris Agreement on climate change. That plan aims to reduce carbon emissions by measures such as requiring that solar water heaters be installed in all new homes and in commercial and industrial buildings. The southern African country aims to cut its total emissions by about a third by 2030, mostly by increasing investment in hydropower and solar power and improving energy efficiency. At the end of June, nearly 28% of Zimbabwe’s electricity supply came from fossil fuel power plants, and about half from hydropower. The remainder is imported, according to ZESA Holdings, the national utility. Businesses so far haven’t played a significant part in transitioning to cleaner energy, even though they have been one of the biggest sources of emissions, said Tendai Marowa, a director with the Business Council for Sustainable Development Zimbabwe. That’s in part due to a lack of clear-cut national policies for driving renewable energy use in industry, which consumes 64% of the national power supply, he said. According to a CZI survey, only 2% of company spending on energy alternatives to the national grid in 2016 went to solar power. Another 10% went to liquefied petroleum gas. The majority – 60% – went to diesel generators, the survey said. But Old Mutual expects that installing solar panels will help it save $16 million it spends each year buying 12 million liters of diesel to supplement grid power, company spokesperson Tendayi Mutseyekwa said. “More than 33,000 tonnes of emissions will be avoided each year,” he said. At Mimosa Platinum, a company in the country’s Midlands province, 360 solar water heaters installed in staff houses three years ago generate 1.5 MW of power. That’s been helpful – but very small in terms of the company’s overall power bills, given the huge amount of power required by the mine itself, officials said. “The financial impact in the context of Mimosa’s overall costs has not been … significant,” said Winston Chitando, Mimosa Platinum’s executive chairman. But the company is now awaiting the results of a feasibility study into using solar power for the mine itself, he said. Altogether, CZI data show that a quarter of companies in Zimbabwe remain completely dependent on grid electricity supplies. 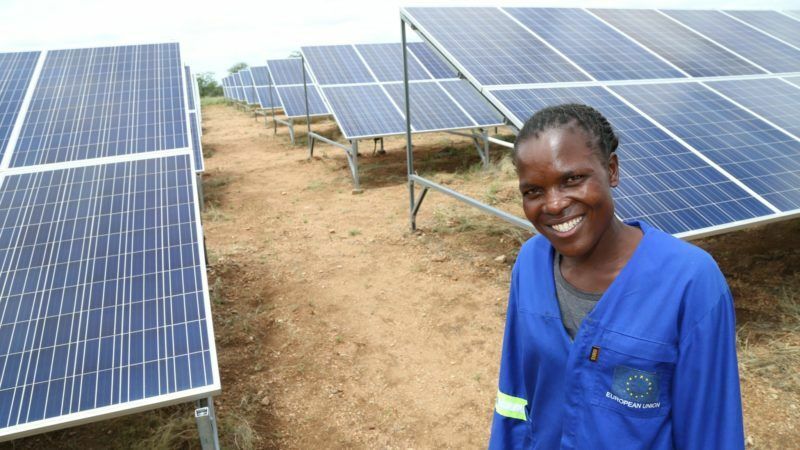 But Tawanda Muzamwese, a Zimbabwean independent energy expert, believes many more companies eventually will make the switch to solar power – a potentially abundant source of energy in a largely sunny country. “Companies are beginning to realize that sustainable energy can improve their competitiveness (and) profitability as well as improve access to foreign markets that are increasingly demanding products produced sustainably,” Muzamwese said.